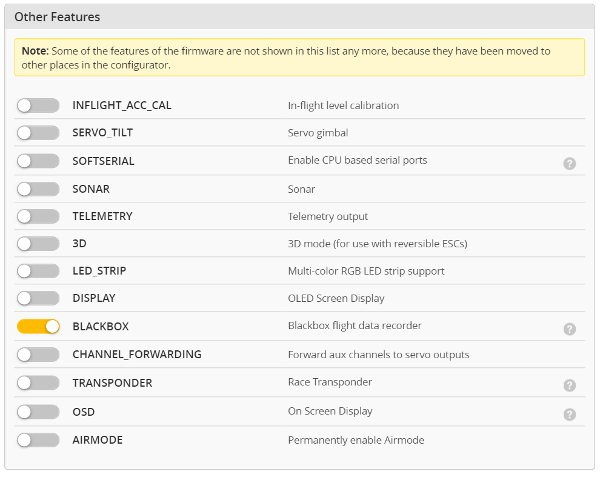 Update 8/31/2016 – The Betaflight guys have made this process a lot more user friendly by adding in new GUI options in both Betaflight Configurator and Betaflight Blackbox Configurator. Make sure you update your apps to get these features! 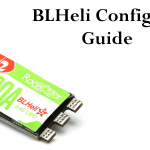 To learn more, check out our article on configuring Betaflight here! 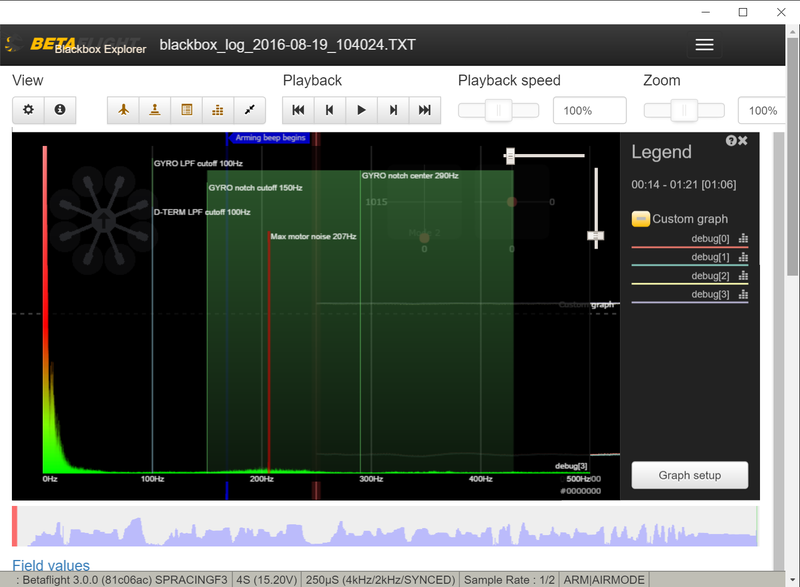 Update 4/3/2017 – Some of the names of the selection boxes have changed in Blackbox Explorer. I’ve updated this article for these changes. Proper filtering of data from the gyroscope is critical to having a smooth flying quad. This is because the gyro senses many things besides deviations from the attitude specified by the pilot. The most notable of these is vibrations from the props and motors. 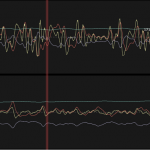 The flight controller software needs to know how to detect and ignore these oscillations so that it can focus on keeping the quadcopter flying smoothly in the manner directed by the pilot. The easiest type of filtering to implement is the low pass filter. This type of filter reduces the effect of vibration above a certain frequency in the data feed that goes into the flight control software. Variations of low pass filters have been implemented in Betaflight for some time now and are also packaged with most gyros – such that they are turned on for use in Cleanflight and other flight control software as well. If you see noisy PID traces like this when analyzing your Blackbox logs, you can probably benefit from enabling a notch filter on your quad. 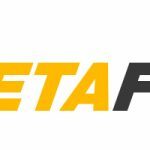 Betaflight introduced a configurable notch filter in the Betaflight 3.0 release. Unfortunately it needs to be tuned to be used, so it is left off by default. Assuming you have a dataflash chip on your flight controller, configuring the notch filter on your quad is actually a simple process. This article will show how you can enable and use the filter to improve your flight performance. The notch filter will affect your PID tuning. Therefore, to have the best tune, it is best to set-up your notch filter before tuning your quad. That being said, if your quad is un-flyable with lots of vibrations on Betaflight defaults, I’d get that sorted out first. My suggestion, since PIDs really don’t matter for this process, is to just keep halving your P values on all axes until you can cruise around with your quadcopter without any oscillations. You can add a notch filter onto a tuned quadcopter. You will not have to re-tune anything and it will improve your performance. However, if you do choose to re-tune after adding the notch filter you can probably eek out some additional gains in the P or D values. Betaflight 3.0 on your quadcopter. Blackbox logging capability on your quadcopter. Enable Blackbox if it is not already enabled. This is generally done in the “Configuration” tab. Clear out your Blackbox logs in the Blackbox tab. Set the Blackbox rate to 1kHz in the Blackbox tab. 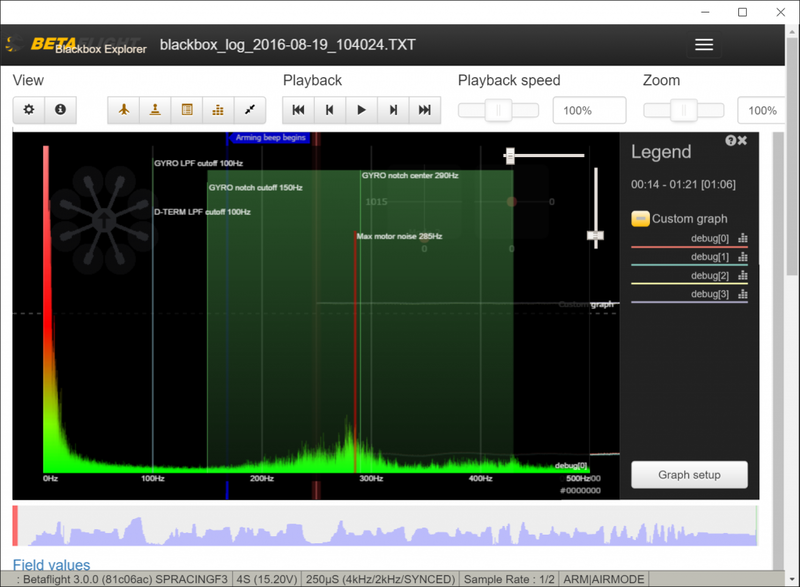 Download the Blackbox logs from your quad (Blackbox tab). Launch the Betaflight Blackbox Explorer and open the saved log. 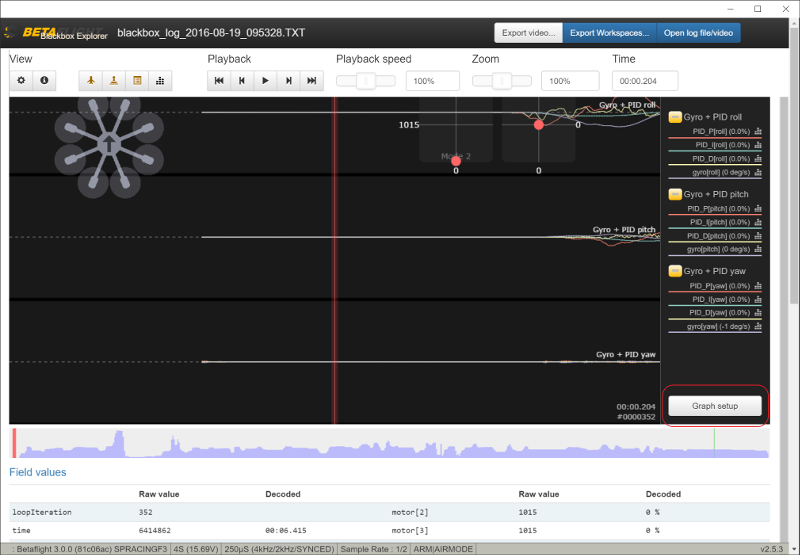 Click “Graph setup” in the lower right hand corner of Blackbox Explorer. Clear out the default fields by pressing all of the “Remove” buttons in the resulting dialog until there is nothing left. Click “Add Graph” and pick “Custom Graph”. 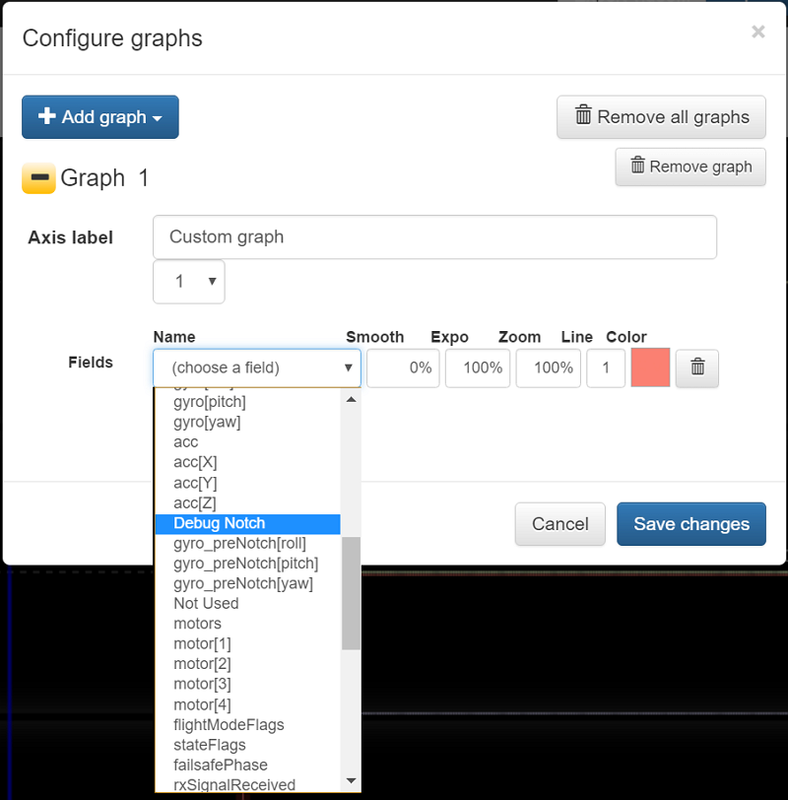 Click “Save Changes” to add the fields to your graph. For those that are curious, these fields are displaying the data coming from your gyro before any filtering is applied. 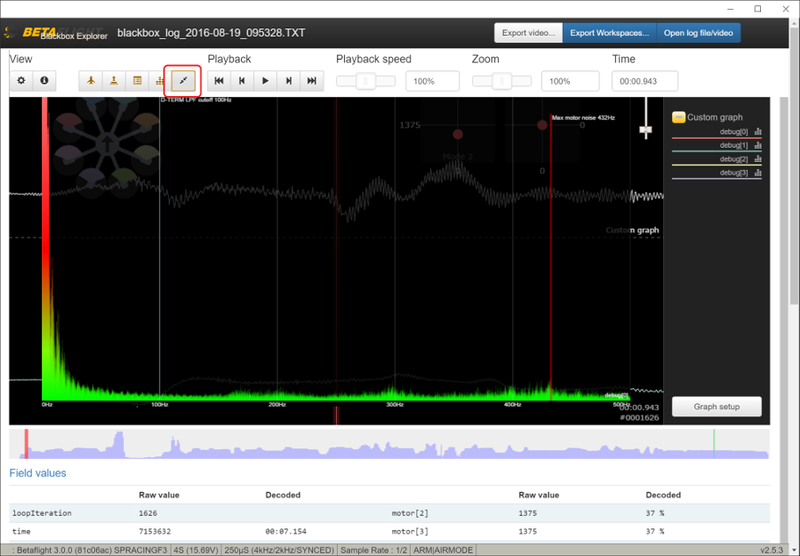 Click the “View Spectrum” icon adjacent to “gyro_raw[pitch]” in the graph legend (right pane). This will cause a spectral analysis chart to show up. Click the icon circled in red. The text has changed since this screenshot was taken but should read “gyro_raw[pitch]”. You don’t need to understand this chart or know how to read it. The answer you are looking for is already processed by the app and displayed after “Max motor noise”. In this case, the quad’s pitch axis is at 432Hz. 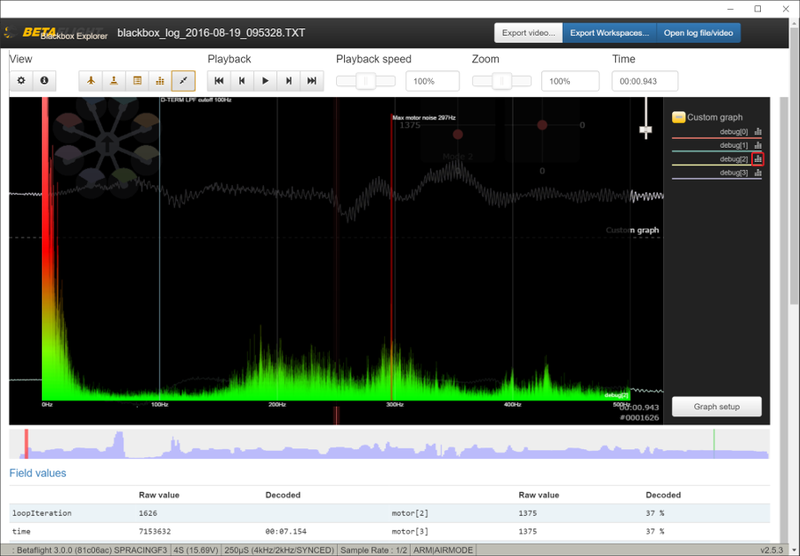 You should note that there are also noise bumps at ~200Hz and 300Hz. 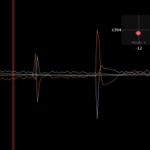 For those that are curious: What you are looking at is the magnitude of all oscillations seen by your gyro. The bumps at 200Hz, 300Hz, 400Hz are harmonics of the vibration caused by either the motor or props of this quadcopter. They are what we are looking to eliminate with the notch filter. Ideally you want to see very small or non-existent bumps on this chart past 100Hz. This pitch trace actually looks pretty good. Now that’s a dirty trace! There is a ton of noise here between 190Hz-500Hz. In this trace you see the max noise was detected at 297Hz. Now that you’ve looked at the graphs for your quad, it is time to decide how to set up your notch filter. You want to set it at a point that has the largest combined noise between the pitch and roll axes. In my quad, that corresponds to 297Hz – which has the highest noise in the roll axis and has a sizeable bump in the pitch axis too. If this confuses you, just pick the “Max motor noise” figure on the noisiest axis. 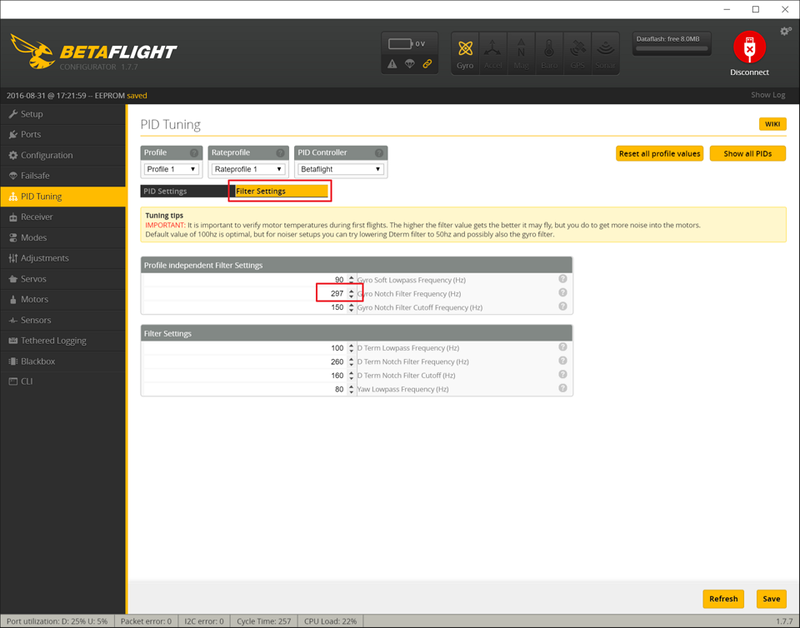 Go back into Betaflight configurator and launch the PID Tuning tab. That’s technically it. You should have a tuned notch filter set-up on your quad. Go out and fly to try it out! Or, you can test that it worked with the following instructions. Clear out your quadcopter’s Blackbox logs. Go out and fly some more. Do the same routine you did last time. Hook the quad back up to your computer and download the logs. Open up Betaflight Blackbox Explorer and load the logs. Set-up the debug graph like you did last time. Check out the spectral analysis for each value. Remember, debug and debug are the raw values, while debug and debug are the corresponding values with the notch filter applied. If you see any improvement from 0->1 or 2->3, your notch filter is working! I only recently applied the notch filter to my quad after a couple of weeks of flying Betaflight 3.0. The difference for my quad was hugely noticeable. Betaflight 3.0 already had the most precise yaw control I’ve ever flown with – this quad now has the best propwash handling I have ever flown with as well. It is an absolute pleasure to fly. Given how easy this process is, I can’t recommend it enough. Roll axis without the notch filter. Roll axis with the notch filter. Pitch axis without the notch filter. Pitch axis with the notch filter. That’s a huge difference in noise! Happy flying gents! Ready to setup more awesome software features? 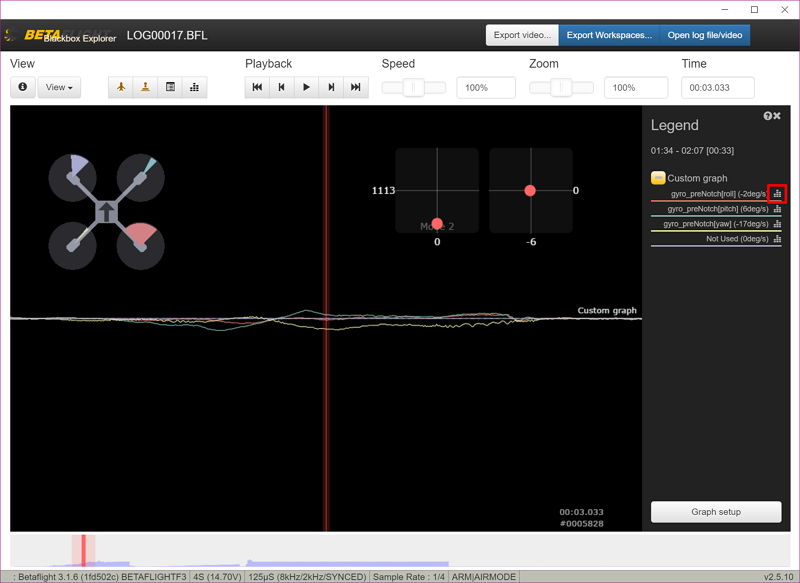 Check out our quadcopter software setup guide here!